A busy day in the Public Square in Hagerstown. There are four trolleys. 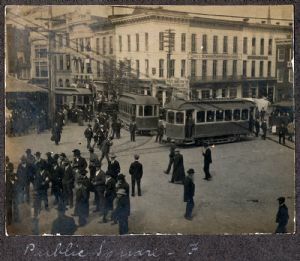 The trolley car on the left is an interurban, having come from Williamsport. The car in front of it is a city car. There are two cars that have arrived in the square from North Potomac Street (based on the angle of their trolley pole). The sign outside Central Drug Co. reads "These cars for the Fair Grounds. 5 cents". Presumably the Great Hagerstown Fair was taking place. The route to the fairground was probably South Potomac, east on Antietam, and north on Mulberry, on the Loop. One wonders what was attracting the interest of the men, and one boy, in the left lower corner.